Oh it’s good to have friendly neighbors with apple trees. It may be even better than having apple trees yourself. No mowing over the windfall fruit. No yellow jackets swarming around all that fallen, bruised goodness. No guilt because you can never use them all. Our neighbors have six apple trees and one pear tree and they are burdened this year. There’s the tree near the road with the smallish green apples that are perfect for eating out of hand. I walked Thistle that way this very morning and ate a dew-wet apple on the return trip. Perfection. Then there are the trees with red apples that are excellent for baking. Pies, applesauce, apple butter, dumplings, cakes–sigh. When I was a kid we’d borrow Aunt Bess’ huge kettle and make apple butter. Dad lined the bottom with boiled pennies to keep the apples from sticking. It was good luck to find a penny when spooning apple butter out come January. The secret ingredient was oil of cinnamon. None of that ground, powdery stuff. This was the pure essence and it really did taste better. Not long after we moved to Western NC my husband and I had breakfast in Oxford, MS, where we opened a jar of apple butter from Snowflake, Va. Ohmygoodness. It was childhood in a glass jar. I checked the ingredients. Sure enough–oil of cinnamon. I drove to Snowflake not long after. The “town” actually had its name printed on both sides of a single sign. Snowflake consisted of a general store and that was it. But inside the general store was a display of apple butter. I bought a case. The next year they shipped me another case, carefully packed and addressed by hand. And then life and time happened and the store went out of business and the family stopped making apple butter for resale. It was a sad, sad day. My hope is they’re still there in Snowflake. Picking Rome apples behind the abandoned store in August, peeling and paring them into a giant kettle over an open fire, cooking them slowly for hours, and adding oil of cinnamon right there at the end. Man. Who wants a biscuit right about now? ← Sometimes you wonder why you bother . . .
I’d rather have mine on cornbread please. The first time you made applebutter was from the womb (6 months) when I stirred and stirred with David sitting beside me on a sawhorse. We ran out of jars when it came to “jarring up” and were putting it in any glass container we could find. You got to eat it an a biscuit before your first birthday! Well that explains my abiding craving! Oh yes, I definitely remember Dusan eating the WHOLE apple. I think the sees are actually bad for you . . . I remember Grandma Jane stirring the apple butter. She would stir for hours, with that big wooden ladle. I’m jealous! We made it with Grandma Burla one time but Grandma Jane was past making apple butter when I knew her. I’m thinking cake donuts with the apple butter. 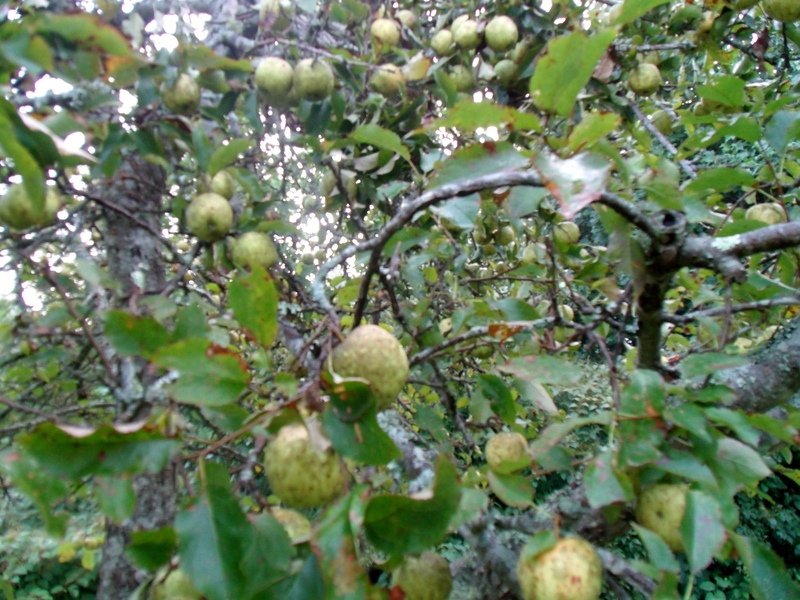 We used to make applesauce with the windfalls from my great-grandmother’s orchard. It was in the city of Baltimore, behind her big, big Victorian mansion. We were not allowed to take any apples off the trees–only off the ground. But the results were just as delicious! We didn’t make apple butter, though. And where do you get oil of cinnamon? Just about any drugstore or craft store. And you have to be careful adding it; it’s potent. When we were in high school it was cool to soak toothpicks in oil of cinnamon and then chew on them. It actually burnt a little! I’m with you in the donuts. That sounds heavenly! Apple butter on gluten-free bread…I’m hungry! What a lovely, evocative post. Thank you! Gluten-free? Well, okay . . .